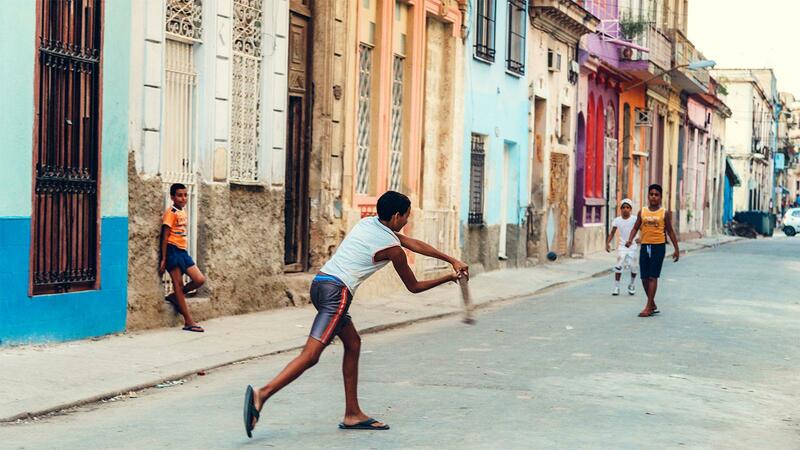 Cuban boys playing baseball on a empty street in Old Havana. In another roll back of Obama-era policies of engagement toward Cuba, the Trump administration has scuttled a major accord between the Cuban Baseball Federation and Major League Baseball that would have permitted major league scouts to recruit Cuban players to sign with U.S. teams without defecting from their country and seeking residency abroad. On April 5, Treasury Department officials informed the MLB that “payments to the Cuban Baseball Federation” as part of the signing bonuses “are not authorized” because they would violate U.S. embargo laws on payments to the Cuban government. The decision to kill the baseball deal comes just days after Cuban officials announced last week that 34 young players would be released for a future in the major leagues. Signed last December after two years of negotiations, the MLB-CBF agreement was modeled after similar arrangements the MLB has made with governments in Japan, Taiwan and South Korea to recruit foreign players. Cuba agreed to release players on its national teams, as well as younger players with potential, in return for 25 percent of the signing bonus to the Cuban Federation. The Cuban players would no longer have to renounce their citizenship, and would be eligible to play ball for their national teams in the off-season. When the accord was signed last December, it was hailed by the MLB, the players union, and the players themselves as a major advance toward ending the dangers Cuban players face in falling prey to human traffickers who have encouraged their defections, and then held them for ransom once they have been smuggled off the island. In 2012, for example, Cuban slugger Yasiel Puig was smuggled into Mexico, held for ransom and threatened with physical violence if it was not paid. Now a star outfielder for the Los Angeles Dodgers, Puig's 23 home runs helped lead the Dodgers to the World Series last year. “For years, Major League Baseball has been seeking to end the trafficking of baseball players from Cuba by criminal organizations by creating a safe and legal alternative for those players to sign with major league clubs,” stated the commissioner Robert D. Manfred Jr. when the agreement was signed.“We believe that this agreement accomplishes that objective and will allow the next generation of Cuban players to pursue their dream without enduring many of the hardships experienced by current and former Cuban players who have played Major League Baseball." The baseball accord, though, was immediately opposed by Sen. Marco Rubio, who has been influential in pushing the Trump White House to reverse Obama’s policy of engagement and impose new sanctions on Cuba. In an interview with Fox News yesterday, Secretary of State Mike Pompeo characterized the decision to abrogate the baseball accord as an effort to penalize Cuba for its support for the Maduro regime in Venezuela.